Gold futures increased their winning streaks on Friday to 11 straight sessions and 4 straight weeks. The yellow metal also closed at a fresh 16-week high. Gold for February delivery on Friday inched up 70 cents, or less than 0.1%, to settle at $1,322.30 an ounce on the Comex division of the New York Mercantile Exchange. The settlement was the highest since Sept. 15 when prices ended $1,325.20 an ounce. "Twenty market professionals took part in the Wall Street survey. Eleven, or 55%, called for gold to rise. 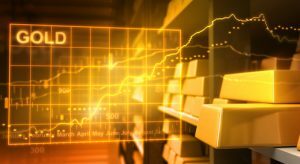 There were five votes, or 25%, saying gold would fall, with the remaining four votes, or 20%, neutral or calling for a sideways market. Meanwhile, 775 votes were cast in an online Main Street poll. A total of 477 voters, or 62%, looked for gold to climb in the next week. Another 217, or 28%, said lower, while 81, or 10%, were neutral." Ending higher for an eighth session in a row, silver for March delivery added 1.6 cents, or about 0.1%, to settle at $17.285 an ounce. The close was the highest since Nov. 17 when prices settled at $17.373 an ounce. Silver futures moved ahead 0.8% this week after two prior weekly increases of 2.4% and 1.5%. April platinum gained $5, or 0.5%, to $975.20 an ounce, for a 3.9% weekly advance. Palladium for March delivery declined $12.55, or 1.2%, to $1,082.20 an ounce, but rose 2% on the week. On Thursday, palladium closed at an all-time high. Gold rose $2.65, or 0.2%, to $1,317.15 an ounce. Silver added 2.5 cents, or 0.2%, to $17.155 an ounce. Platinum moved up $7, or 0.7%, to $966 an ounce. Palladium fell $5, or 0.5%, to $1,095 an ounce. Their weekly gains reached 1.6% for gold, 1.7% for silver, 4.2% for platinum and 3.7% for palladium. U.S. bullion sales were unchanged this week, according to the agency’s online data. Below is a sales breakdown of U.S. bullion products with columns listing the number of coins sold during varying periods. Products with an asterisk (*) are no longer available.